Cost of the terrain creation. I'd like to use realistic terrain from satellite pictures for my game and add there foliage via SpeeTree. What I need to know is the price and time of creation of one square kilometer of terrain with and without the foliage to know how big budget I'd need for my game. Can you send me your rates or quotes or just your guess or opinion on that and describe a bit of process how to exactly add terrain from satellite pics and add the foliage? Thanks in advance. Re: Cost of the terrain creation. I believe Outerra works by using height map data and then by location and other variables decides what textures the grounds should have. OT can't use satellite imagery directly, it would have to be vectorized first, but the tools and rendering pipeline for it aren't yet ready. Although in theory you could use SpeedTree models (with proper LODs etc), rendering cost on areas of OT typical size will be prohibitive. The only thing I wonder about Speedtree is that they are pretty much the worlds acknowledged leaders in the 3D trees-for-games field. If their stuff is prohibitive to render, I wonder what on earth Outerra will finally use. I'd like to know as well. In one thread you said Outerra could have "a few trees as models", I was wondering if you could estimate how many and how much tree diversity would affect that? (as in, having X amount of one 3D tree and X of another one also on 3D). Hope I made myself clear . I guess you could test that by using some 3D tree models and placing them around as objects. That's basically how engines that do not have to bother with millions of trees usually work, when not trying to optimize tree rendering beyond the standard object rendering measures. 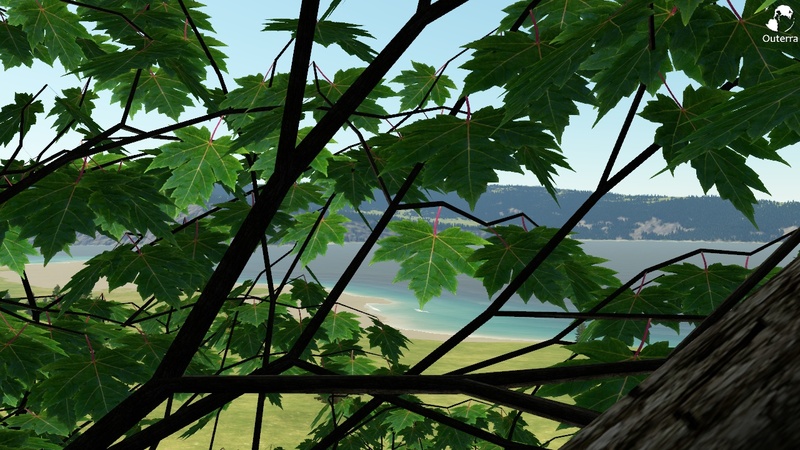 Provided the tree models are good, with as few draw calls and textures as possible, you can get to a relatively high number of trees. Of course, as objects they will consume much more memory and will be slower than a specialized renderer would be. Mmmm, I feel like I'm lacking the knowledge to fully understand this. What would a specialized renderer be? I thought trees were going to be implemented in a traditional way, as in add 3D models with higher detail for what's really close and go reducing the quality after each LOD model to the point they become textures (which is what the engine does right now, right?). Again, excuse my ignorance, this kind of stuff is out of my league... but I'm awfully intrigued jaja. I could have sworn I saw something about using more traditional tree model's first, before eventually moving onto the 3rd procedural stuff. What would a specialized renderer be? I thought trees were going to be implemented in a traditional way, as in add 3D models with higher detail for what's really close and go reducing the quality after each LOD model to the point they become textures (which is what the engine does right now, right?). That's it, the problem is only how one gets all the required LODs that will switch seamlessly and will be as efficient as possible. Procedural tree generator is mainly about being able to generate vegetation geometry for the most efficient rendering, with all their LODs up to that billboard that we are currently using. But it's not just the generator that is meant to be procedural - it's also the rendering, which can make the individual trees varied in shapes, while they fall back into generic shapes with distance so they can switch to a lesser (and less varied) LOD there. ... and that's why I wrote somewhere that we'll probably test that first. Might not be ideal with regards to performance and seamless transitions (lighting and geometry popping up), but faster to get some results. You crazy Slovakians never cease to amaze me. Carmack once said Procedural generation was just a crappy form of data compression, the fact that you guys are proving him wrong only makes this colossal project a bit more epic . Maybe it will be something like this open source solution. Carmack once said Procedural generation was just a crappy form of data compression, the fact that you guys are proving him wrong only makes this colossal project a bit more epic . This has been an argument going back decades: “now is the year of procedurally generated textures and geometry.” We’ve heard that for a decade and it never has come true. What has won is being able to manage the real data that we want. Procedural-ism is really just a truly crappy form of data compression. You know, you have the data that you really want, and procedural-ism makes you something that might resemble what you really want, but it’s a form of extraordinarily lossy data compression that lets you produce something there. It's not exactly right, because Carmack was talking about content driven by procedural generation. Outerra avoid this problem by going the other way: procedural generation is used to improve the data. This quote was also from an interview about Rage, and it should be noted that they have gone to the other side of the spectrum with this version of the Id tech: it's true that artists where more in control of the rendering, but the result was a world extremely static, and with an insane visual loss between long distance/close elements. Interesting decision, but I guess since it worked well in MSFLIGHT, this is a logical move for them. I haven't decided if I like speed tree yet. It's included in a train sim I use and it looks really ugly if not done right. There's only a bunch of trees made by one particular guy that look real. But the tech behind speedtree is very good.